One of the most popular ways to adjust MS Word documents for viewing without ability to edit their content is converting files to PDF. PDF documents are protected from any changes. Today PDF documents are viewable even in standard web browsers, so there will be not a problem to open these file in any system. If you would like to combine several DOC files to one multi-page PDF documents, you can do this with the help of PDF Combine Pro. This handy file combiner is able to create a single PDF file from any number of DOC originals, adjusting them to the layout you specifically need. Bookmarks - mark each combined file with a bookmark for easy navigation. As for the bookmarks, they can be created from the source file names or basing on some external file with captions. These features will help to increase the usability of output PDF copy, especially if it consists of big number of source files. 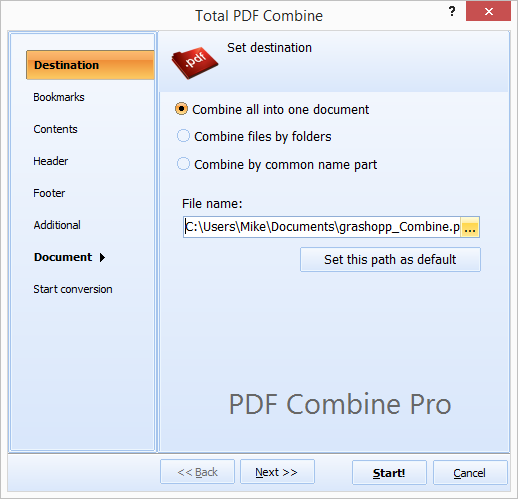 PDF Combine Pro also can combine DOC to PDF by folders. If you have 10 folders with several Doc files in each, you will get 10 PDF files. Another option is combining by the common file name. These modes can be selected in the Destination tab of the settings wizard. All these settings are not required: use them only when needed. Combining files with default settings is the fastest way to process many documents. 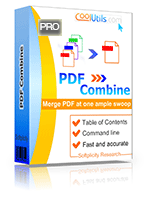 PDF Combine Pro is available in free trial version, so you can check its functionality before the purchase. Do it now!